ERP Selection | ERP the Right Way! First, it means that there is a new way in which business software solutions are being purchased and consumed, and that means resellers need to pay close attention to the way they run their business. 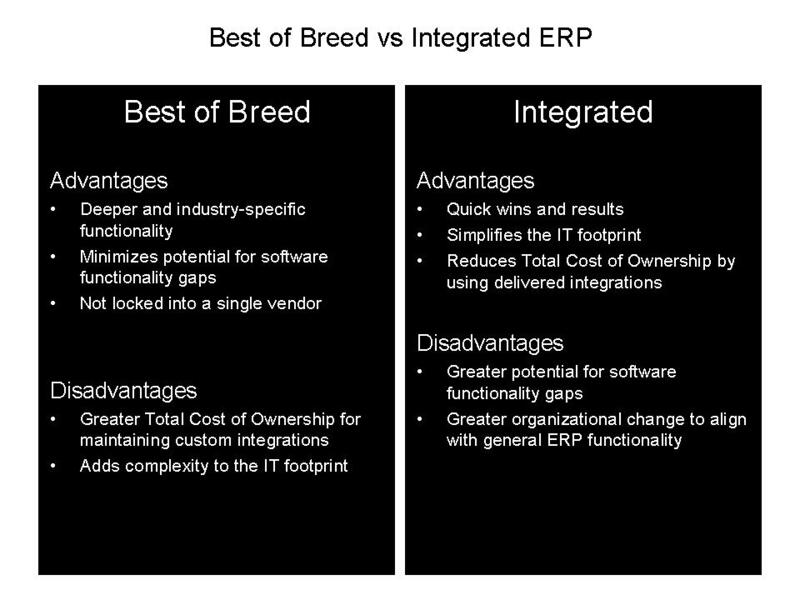 Secondly, it means that if ERP companies wish to remain in the game, they need to make some significant changes. Cloud on its own doesn’t affect the validity of ERP. Businesses still require management software to help them run their organization effectively. 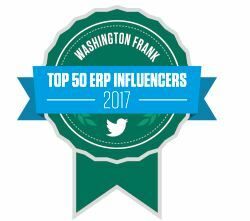 What Cloud does do however, is level the playing field and make ERP solutions more accessible to the consumer. That means publishers and resellers need to pay attention. New Cloud companies are popping up every day, and while laggards scramble to bring their on-premise solutions to the Cloud, these born in the Cloud players are discovering faster, easier, and less expensive ways to deliver ERP. Complex, highly customized and bulky solutions which come with a hefty price tag and a collection of features and functionality not required by the end-user are quickly being replaced by pay as you go solutions. Customer expectations are also changing; soon no one will be willing to accept that ERP requires a huge capital expenditure and lifelong commitment without first researching alternatives in the cloud. While Cloud ERP is still an emerging market, it is fair to say that we’re moving beyond the early adopter stage. 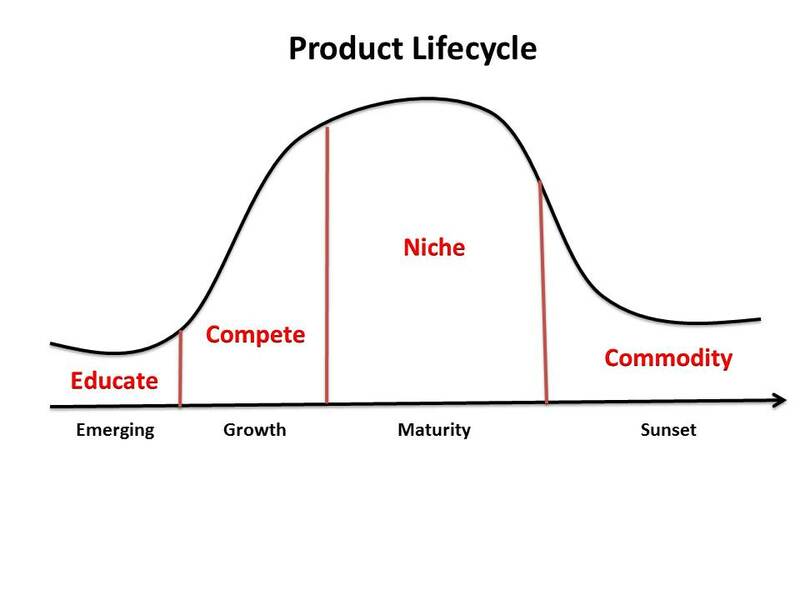 We’ve crossed the chasm, and are quickly headed towards the early majority market. Within the next 2 years we can expect to see a majority of ERP purchases made in the cloud. 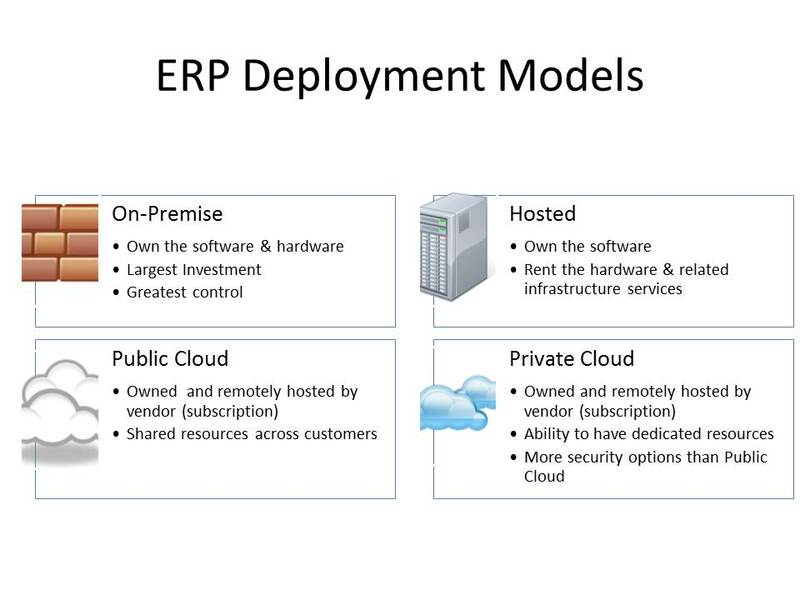 In our opinion, Cloud ERP will not be an initial threat to a vendor’s existing up-market ERP customer base. This market is highly saturated (+90%) and today we do not see a compelling value proposition for large customers to move completely to the Cloud. We do see opportunities where Fortune 500 ERP customers may be interested in implementing edge software products in the cloud (ex. 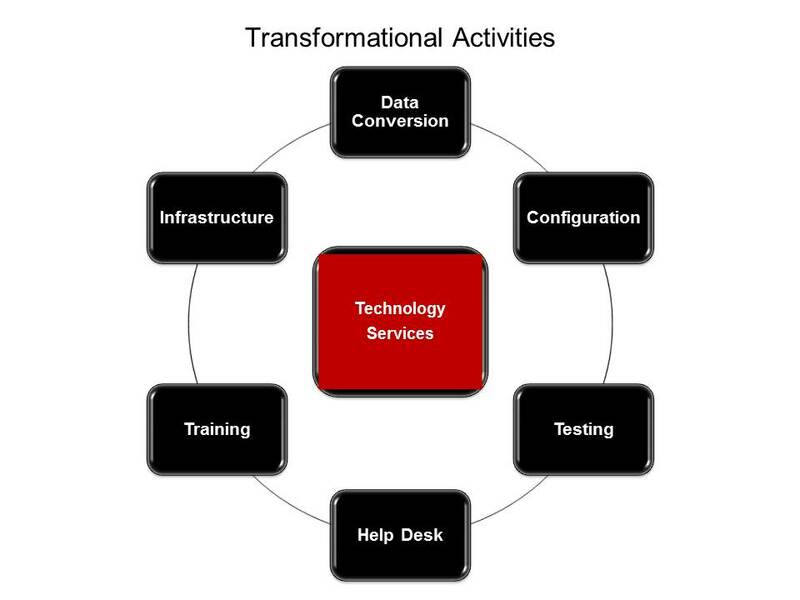 travel & expense, self-service, tax calculation and compliance, etc) as part of a hybrid deployment model. Where we do see a threat/challenge to on-premise ERP is in the SMB arena – especially for new customers. 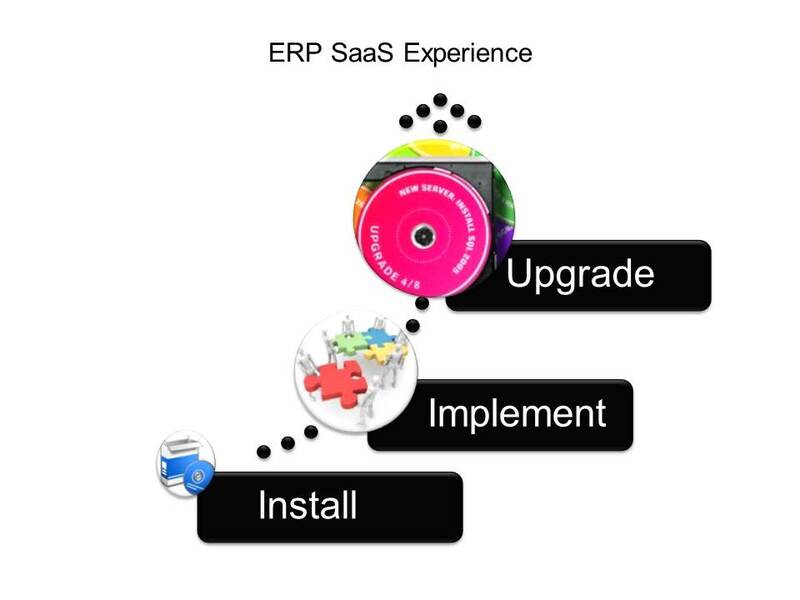 This market continues to be a strategic growth area for ERP and customers have a greater flexibility to leverage a SaaS or Cloud model. While it doesn’t appear that the fate of on-premise ERP solutions is entirely bleak, there will certainly be a marked shift towards Cloud based ones. In fact, the resellers can already feel this happening. There are fewer people out there looking for business management systems in general, and in a time of economic uncertainty and tight budgets, the appeal of an operating expense and a per-seat price is more than appealing. Customers are becoming more likely to change their processes to align with the functions of a less expensive Cloud based solution, than to go through the process of building one which is fully customized. What’s more, people are less likely to pay the large price tag most often associated with ERP services, instead preferring a solution in which they can turn off functions (thus reducing costs) at their leisure. So no, Cloud isn’t exactly ringing the death toll for ERP solutions, but it is changing them. ERP will always be required by many types of organizations, but on-premise ERP may in fact not survive this shift long-term. If traditional ERP companies hope to survive the transition they need to be proactive about developing their Cloud solutions, and that means more than throwing up a landing page and calling yourself a Cloud player. If you’re an on-premise ERP reseller with no Cloud transition plan, you better get started. That means developing a team to strategize taking your solution to the cloud, putting the necessary resources behind it, and understanding why some customers have an inherent fear of the Cloud. If you’re already developing your Cloud solution, then keep at it and make sure you’re not just focusing on the solution, but on the marketing and sales as well. And if you’re already well entrenched with an ERP solution in the Cloud, then you should get ready to defend your competitive position because you won’t be alone for long. Additionally, if you’re a company seeking out a new ERP system, you should carefully consider the benefits of using a Cloud solution. While we’re only entering the early majority market, Cloud computing is the wave of the future. As consumption models go, Cloud works for a majority of businesses today, and the list continues to grow. If you’re looking to move some of your capital expenses into operating expenses, and looking for a better way to manage your business, ERP in the Cloud might just be for you. Jason is an industry analyst for Software ThinkTank. Software ThinkTank is an online resource that helps businesses keep up-to-date with the latest trends, technology innovations and business solutions through a range of articles, case studies, guides and tools. Visit SoftwareThinkTank.com for more information. Blog Sponsor – Cardinal Point Solutions, LLC. I recently completed a software selection project for a mid-market discrete manufacturer. A key activity for software selection is prioritizing requirements. The following table provides an executive summary of our requirements gathered. Allow me to make a few key points. Gathering requirements is an iterative process. The objective of requirements gathering was to define requirements to a level where the customer could make an informed decision on selecting an ERP solution. As the implementation progresses from software selection to implementation the high-level business requirements will be further refined. Second, as you gather requirements it is important to capture business pains and benefit opportunities. Pains are limitations or barriers that keep business from meeting their objectives. Pains may result in additional requirements and/or opportunities for quick wins. Benefit opportunities are directly related to business requirements and will enable the customer to start with developing the business case up-front versus towards the end of software selection (which is reactive and a bad practice for software selection). Individuals should consider their top 3 – 5 business requirements. As a group we will determine priorities for all requirements (not just your own). “Must Have” requirements include competitive, strategic, and compliance business needs. 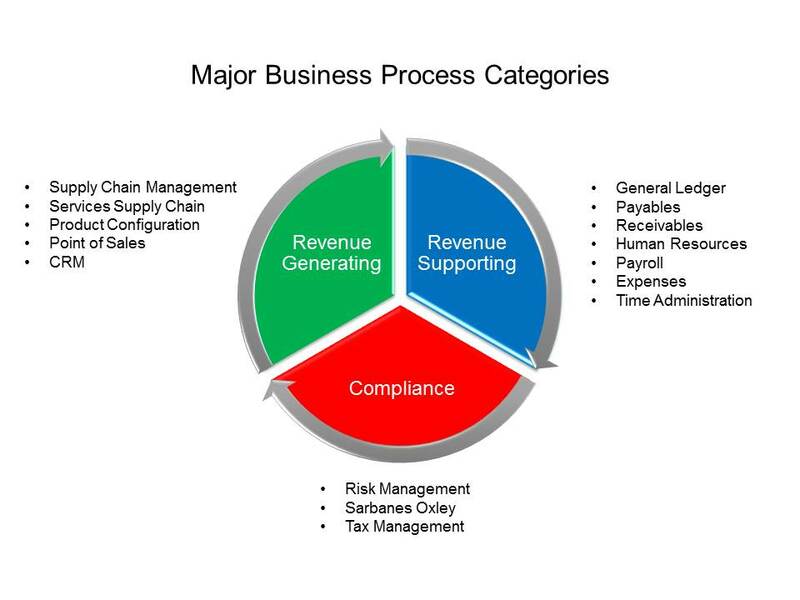 Revenue-generating business processes should drive the majority of these requirements. “Valuable” requirements are usually not “show stoppers” however, they will add quantifiable benefits to the organization. “Nice to Have” requirements are convenient but do not provide a significant or quantifiable benefit to the organization. Rule of Thumb: Demonstration scripts for vendor demos should primarily focus on “Must Have” requirements. No every requirement should be marked as “Must Have”. Prioritization should be solution-based, not functional-based. 80% of benefit is generated from 20% of effort (requirements). 20% (138) of the total requirements (688) gathered should be prioritized as “Must Have”. 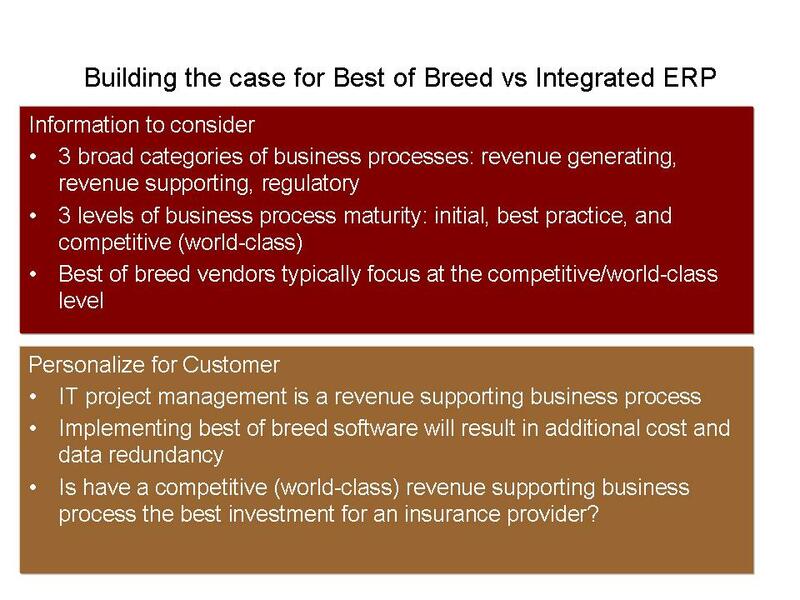 Prioritizing business requirements for an ERP selection project is both an art and a science. Sorry to say that there is not a simple formula that can help you magically produce appropriate rankings. There are heuristics like Pareto’s principle that can provide you “signs” that you are heading down the right path. 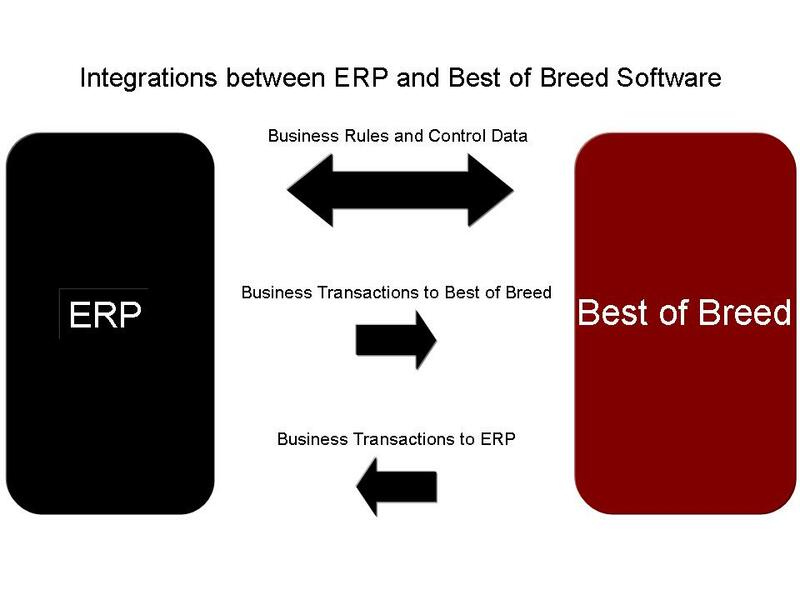 How well does the ERP software fit with (a) current business requirements and (b) future business requirements? Too often I see vendor responses and demonstrations spend too much time on “core” functionality and not enough time on the unique and strategic requirements of customers. These are the requirements that generate a competitive advantage to customers. Two key activities need to be performed: (1) internal technical assessment and (2) external technical assessment with each vendor. The internal technical assessment consists of identifying the current state of the customer’s IT environment: in terms of hardware, software, FTEs, and skills. The external technical assessment consists of identifying the technology requirements of the vendor’s ERP software in terms of hardware, software, FTEs, and skills. You then perform a comparison (fit/gap) to identify the technical requirements for the customers to move to the vendor’s ERP solution. Quantifying the technical gap is very important in calculating the financial fit. This area is typically overlooked and underestimated. It is important to understand how the customer’s organization must change to effective support the new ERP solution. Many customers know that they must change, however few understand how and the amount of change that is required. What is the total cost of ownership across the expected lifecycle of the ERP solution – including installation, training, implementation, maintenance, upgrades, hardware, ERP software, 3rd part software, process improvements? It’s important to set the expectation that the proposed gains will not be realized in the initial implementation but over the expected life of the ERP solution. The end result of the financial fit is the business case. As with any business case there will be assumptions, constraints, and estimation accuracy (ex. Order of Magnitude) so please ensure that you clearly specify this information along with the value proposition. ERP software selection is an important step in your goal of implementation a new business solution. I hope that the information will assist you in being successful.